Spark – A book review! Being in the fitness industry I already think that exercise is important for everyone’s day to day life no matter what age. There are tons of studies, test, and every magazine has their get fit quick advice. One thing all of these have in common is they are strictly about the physical. The main reason that people get into exercise is because of the physical aspect of it. But, what I have found is that the main reason people stay with a fitness program is the mental aspect. My clients have said that their gym sessions are their relief, mental break, escape and the list goes on of how their workouts make them feel. That is exactly what this book discusses. It describes how aerobic exercise can benefit the brain tremendously. 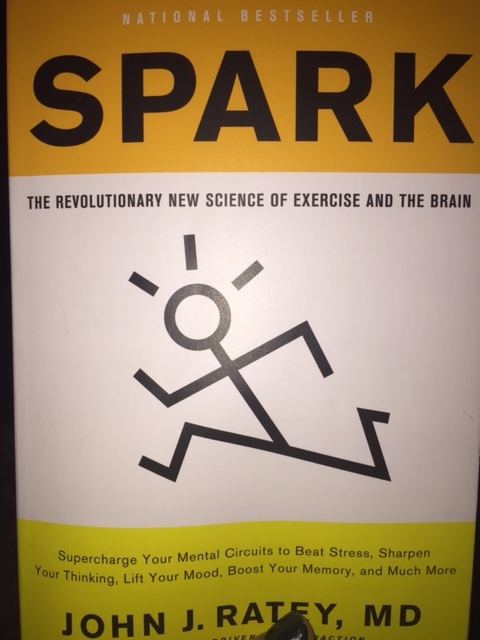 How just by getting your heart rate up you can restore, energize and relieve multiple problems.In the book the author describes exercise a lot like Prozac and many other antidepressants. With all the money pharmaceutical companies make off of people especially in this stressed out economy and world, it is nice to know that there is a way to combat aches and aliments that are no more than the price of running shoes. If you are a person who is not that sure about exercise or why you should even bother doing it then this is the book for you. It is scientifically based information about why aerobic exercise is not only good for the body but for your mental state as well. One of my favorite excerpts in the book is “Nobody says exercise cures cancer, but research suggests that activity is clearly a factor in some forms of the disease: twenty-three of thirty-five studies show an increased risk of breast cancer for those women who are inactive; physically active people have 50 percent less chance of developing colon cancer; and active men over sixty-five have a 70 percent lower chance of developing the advanced, typically fatal form of prostate cancer”.(pg. 84) If you can do anything to be proactive as a form of preventative medicine, why wouldn’t you? This book is more focused on aerobic exercise and its benefits on the body but it touches on weight training also. For those of you that fear the weights don’t think you can use this book as a reason to avoid them. Another excerpt I enjoy and that I read to my parents is , ” A very recent study among older adults found that lifting weights twice a week for six months made participants stronger and actually reversed aspects of the aging process at the genetic level. The genes responsible for producing some of the key factors for brain growth (VEGF. FGF-2, and IGF-1) acted as if they were thirty years old, not sixty-five”. (pg. 258). If you want your brain to be forever young then its a great idea to incorporate some physical activity into your life. Now I’m not saying you have to go for hours everyday and go hard. But, I am saying work up a sweat, and do things you enjoy. If you don’t enjoy what you’re doing you won’t stick with it. Everyone wants a better body and to look good. However, that is not always enough to drive someone to workout. So I hope the facts of how working out can help more than just your physical appearance is enough to push you in the direction of integrating or upgrading what you do at the gym. After reading this book I went for a six mile run. That’s how motivated I was by all the benefits this book described. Granted being in this field I was aware of a lot of them, but I learned a lot of new things which is something I love about being in the fitness industry. It is a field that has continual information and studies being done, which keeps me engaged and always educating myself. Previous Post Mile High Run Club! Next Post International Women’s Day!